A piston is part of reciprocating engines whose purpose is to transfer force from expanding gas in the cylinder to the crankshaft, according to aircraft engine maintenance experts. In steam and internal combustion engines, valves are necessary to control the entry and exit of gasses at the proper time in the piston’s cycle. 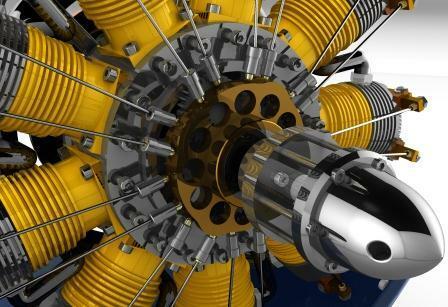 There are several different types of valves found in aircraft engines. Sleeve valves were first patented by Charles Yale Knight, and were used in some luxury automobiles. The Burt-McCallum sleeve valve was eventually adopted by Bristol for use in radial aircraft engines; this was a single sleeve, which rotated around a timing axle set at 90 degrees. Compared to other sleeve valves, the Burt-McCallum version used less oil, thereby reducing some of the aircraft engine maintenance requirements on this type of valve. The sleeve valve was used extensively in British aircraft engines in the 1940s until improvements were made in the poppet valve. Also known as a mushroom valve, poppet valves control the timing and quantity of fuel flow into an engine. Poppet valves, which get their name from the French word “poupette,” meaning youth or doll, operate much like a marionette as they move in response to remote motion transmitted from the engine. Instead of sliding or rocking over a seat to uncover a port in the manner of sleeve valves, the poppet valve lifts in a movement perpendicular to the port. Because there is no movement on the seat, there is no need for lubrication. However, in the early days of using poppet valves, aircraft engine maintenance was increased as poppet valves needed to be re-ground every two years or so as the metals used at the time were not as durable as today’s metals. Today, most poppet valves are made of stainless steel, and re-grinding is not necessary as part of aircraft engine maintenance. 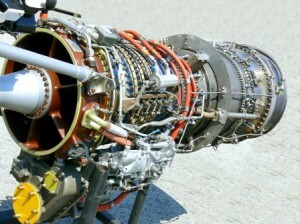 To learn more about the importance of aircraft engine maintenance or about the different types of aircraft engine valves, visit us at www.covingtonaircraft.com. Also join us on Facebook and LinkedIn. As part of any aircraft engine maintenance, or aircraft maintenance in general, planes must be washed, both inside and out, on a regular basis. However, cleaning an airplane is very different from washing the vehicle you drive. One of the main differences between washing other vehicles and washing planes is that the fluid used to wash planes contains detergents, traces of oil, hydrocarbons and solvents not found in regular washing fluids. Because such chemicals are pollutants, they cannot be directed into storm water drains. This is especially true during aircraft engine maintenance that includes washing the engine. 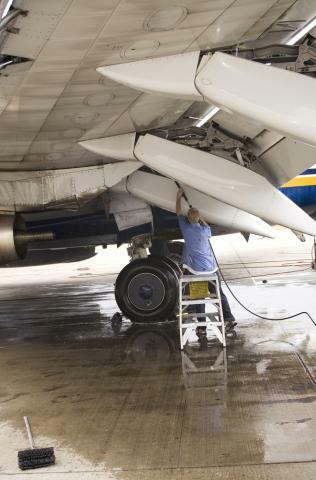 During aircraft engine maintenance, as well as other plane maintenance, aviation mechanics use high-pressure hoses to wash the aircraft without water by blowing build-up and debris off the plane. When water is used, it’s mixed with detergent specifically designed for cleaning airplanes, using the minimal amount necessary to clean the plane. Wastewater from the plane is recovered using bundling equipment and a wet vacuum. Mechanics dispose of the wastewater in accordance with the SA Water Trade Waste General Policy. Because much of a plane is made of aluminum, which is a lightweight but strong metal, certain chemicals can have an adverse effect on the metal. Therefore, the FAA issued warnings that during aircraft engine maintenance, care must be taken with alkaline chemicals as they can damage any aluminum on the plane. 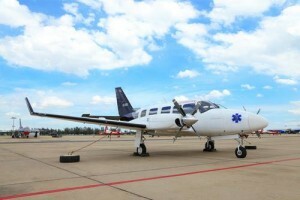 In addition to the aluminum in a plane, care must be taken with the Plexiglas on the aircraft as well. Plexiglas must be cleaned in stages with plenty of water, followed by wiping with a clean flannel cloth using approved Plexiglas cleaner or polish. Avoid using high-powered pressure washers, as they can damage the plane. Visit us at www.covingtonaircraft.com for more information about radial and turbine airplane engine maintenance, overhaul and repair. You can also find us on Facebook and LinkedIn. 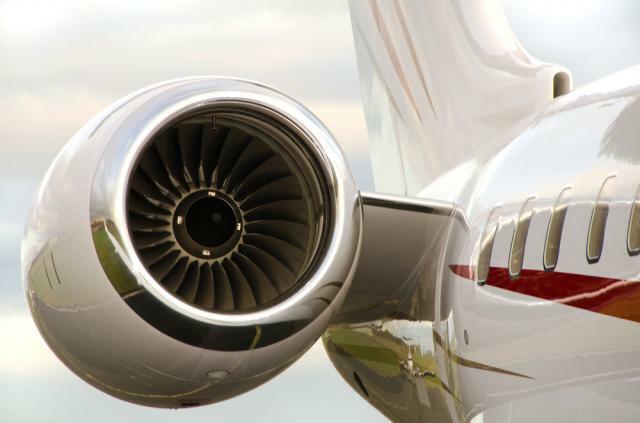 As specialists in aircraft engine maintenance, Covington Aircraft understands the importance of regular maintenance on engine driven fuel pumps, especially during an aircraft engine overhaul. Knowing the different types of aircraft fuel pumps is helpful to understanding the aircraft engine maintenance your plane requires. Although Covington Aircraft is known around the world as a leader in PT6A, R-985, and R-1340 engine overhauls, that’s not the only thing they do. They offer many aircraft engine maintenance services. In fact, Covington offers a variety of other services beyond the overhaul. They offer multiple types of inspections, including the 100-hour inspection, annuals, hot section and bora scope inspections. If you are preparing to buy an aircraft, Covington Aircraft will even perform pre-buy engine inspections so that you know what you are getting before you buy. Their maintenance services include light airframe work, fuel nozzle overhaul and flow checks, compressor washes and propeller balancing, to name a few. And, they’d be happy to help you with the removal and installation of your engine if you need it. So, whether you’re looking for a complete overhaul of your engine, or just some maintenance or repairs, the experts at Covington Aircraft have a service plan to fit your needs. Save for factory remanufactures, all overhauls are permitted by the FAA to be performed to either new or service limits, but what’s the difference between new limits and service limits? Every engine design is assigned a published table of both new limits and service limits for all critical parts. When new, these parts are required to be within a certain new limit size tolerance, but inevitably, the parts will wear through use to dimensions outside those limits. In order to provide for this, each part also has a service limit, which helps define tolerances for a part in service. When a part no longer meets new or service limits, it is considered to be out of service limits and the FAA requires that it be either repaired or discarded. The limits are usually defined by a minimum and maximum size often as small as thousandths of an inch. Dimensional limits are measured by the use of precision measuring tools, such as micrometers, bore gauges, or calipers and are alternately defined as a part measurement or the clearance between two parts. a used part that meets only service limits into an overhauled engine as a replacement. This type of overhaul is known as a service limit overhaul, and is commonly seen in factory engine overhauls. Unfortunately, this practice allows manufacturers to reinstall a part that checks out during inspection with a service limit reflecting considerable wear before that part is considered to be out of service limits. 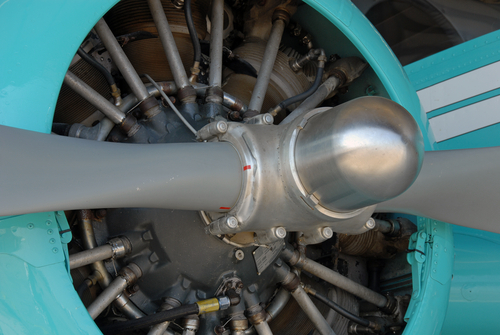 Last week, we discussed what various terms mean when it comes to aircraft engine overhaul. Today we’ll dig in deeper, and detail the difference between two different kinds of overhaul: service limit overhaul and new limit overhaul. Save for factory remanufactures, all overhauls are permitted by the FAA to be performed to either new or service limits, but what’s the difference? 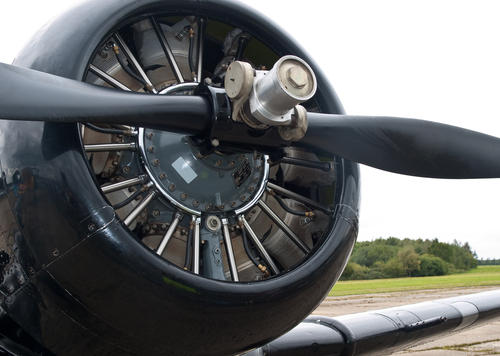 We at Covington Aircraft are here to take the mystery out of aircraft engine overhauls and help you get the most out of your overhaul when TBO time arrives for your radial or turbine engine. By definition, an aircraft engine overhaul involves cleaning, carefully inspecting, and repairing or replacing parts to meet service limits. It is therefore entirely legal to placea used part that meets only service limits into an overhauled engine as a replacement. This type of overhaul is known as a service limit overhaul, and is commonly seen in factory engine overhauls. Unfortunately, this practice allows manufacturers to reinstall a part that checks out during inspection with a service limit reflecting considerable wear before that part is considered to be out of service limits. For this reason, service limit overhauls aren’t very likely to reach TBO without requiring further maintenance down the road. While in some special cases installing a service limit part might be acceptable, given the expense and time cost of performing an overhaul, it’s usually a good idea to request that parts used in the overhauled engine meet new limits. This type of overhaul is known as a new limit overhaul and will help you to establish a baseline of wear that is consistent with a new engine, extend the life of your engine, and preserve the resale value of your aircraft. If you’re looking for your engine to reach TBO and have reliability and longevity, a new limit overhaul is usually your best choice. When TBO time rolls around, it’s important to remember that new engines made it there because of the new limit requirements of the engine manufacturer. So when you make your decision on aircraft engine maintenance, the safest bet is to stick with the limits that got your engine this far in the first place. Anything less could result in more costly maintenance down the road. If you have any questions on engine overhauls or general maintenance, be sure to let us know. Happy flying! Aviation allows us the freedom to travel, the ability to pick up and fly to anywhere in the world we choose to go. Add that option to the growing globalization forces, and you have increasing aircraft engine repair and aircraft engine maintenance done overseas. At Covington Aircraft, we’re committed to helping our international customers in just the same way we would our neighbors down the street. There are now more PT6A engines in international markets than there are in the United States, which adds up to more engine repair and overhaul needs for our international customers. Since we do almost as much international business as we do domestic, we’ve made it a point of focus to be sure that Covington’s Core values will be represented to all of our customers. Regardless of where you live in the world, Covington’s four core values; Integrity, Affordability, Dependability, and Quality Service, most likely matter to you. These values transcend any one culture or locale. We have people around the world flying aircraft powered by Covington engines, and we always treat our international customers with the same kind of care as our customers in the US. Most recently we’ve worked with the German Airlines Lufthansa and Cessna Caravan on their aircraft maintenance needs abroad. We offer the same great rates to our international customers as we do to our domestic partners. If we’ve quoted a customer a price and we find out that we were able to do the job at a lower price, we will charge the customer a lower price. To us, it doesn’t matter if you are in Siberia or in suburbia, doing what’s right for our customers is what sets us apart from our competition. It’s a global world, and Covington is here to do right by our customers. Wherever you do business, you have to practice what you preach, and at Covington we always go above and beyond our customers’ expectations.